The last two weeks have been big in terms of Blu-ray releases but may have been even bigger in terms of the bigger industry picture. New pricing for Netflix has inspired internet rage and Blockbuster has responded by offering a new way to rent movies. 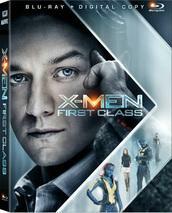 'X-Men: First Class' Dated for Blu-ray! Based on the early previews and shots from the set, 'X-Men: First Class' looked like it was going to be a pretty awful flick, but now many are considering it to be the best in the franchise. If you didn't get a chance to see it in theaters, you can find out for yourself when it comes to Blu-ray September 9th. There's something that's just so captivating about young girls as assassins. Hit Girl from the movie 'Kickass' proved that and Hanna steps things up. The movie is tremendous, and a must see when it comes to shelves September 6th. 'Pirates of the Caribbean: On Stranger Tides' Blu-ray Dated and Detailed! Fans of the 'Pirates' franchise will be able to get their hands on the latest film on October 18th when it comes out in a DVD/Blu-ray combo pack. Of course, a 3D version will be available the same day for a price $10 higher than the standard. I would be remiss if I didn't mention that one of my dad's absolute favorite flicks is coming to Blu-ray on November 8th. It features great performances form Trevor Howard, Richard Harris, and none other than Marlon Brando. As great as 'The Cider House Rules' is, the essential pickup on October 8th - when both films are released - is 'Life is Beautiful.' No other movie starts so lightheartedly and sweetly and then ends in such tragedy. It's an incredibly effective film and an essential addition to any collection. If you've got an iPad, you can get a free look at some of the features that will be included on the new 'Star Wars' Blu-ray set. If you have an iPod Touch or an iPhone, you'll only have to wait until August 2nd to get your hands on the app. Don't Forget to Save Fifty Percent on Criterion Blu-rays at Barnes & Noble! Criterion films are well known for being not only excellent and important movies, but for having the best transfers and most complete special features as well. They're also a bit on the pricey side, but until Aug 1 you've got a chance to get them for half price at Barnes & Noble. Something had to happen eventually and the time is finally here. Netflix has separated unlimited streaming from their DVD and Blu-ray by mail packages. If you want both, you'll be paying for both at a price starting at $15.98. Blockbuster has a solution for those that dropped their disc by mail service from Netflix. Instead of subscribing to two services, just get discs from Blockbuster any time you want. For five bucks you get a DVD or Blu-ray for a full week and you get it mailed right to you. It's an interesting step as far as TVs go, but don't get too excited at the prospect of having a TiVo built right in. You may get the same TiVo interface and access to the same services as TiVo users, but there's no hard drive built in and no DVR capabilities. We've been waiting a long time for Spotify to reach the states, but the UK's favorite music streaming service is finally here. You can try out the free ad-supported version or shell out for one of the upgrades including Spotify Premium, which gives you access to the service on your smartphone. Roku's newest devices here and they're smaller and more capable than ever. They boast marked improvements while remaining at the same price points and even boast the ability to play games, though the selection is going to be very limited at first. Hope you like 'Angry Birds!"